Saw some old UP FA colleagues and also met a lot of comic pips (Thanks to Stan Chi). How I wish I had more time to check out the indies. (I also forgot to approach some people.. sorry!) Met my favorite artist, Carlo Vergara!!! At last, I got the last copy of the old "One Night in Purgatory" sayang, I'm sure a lot of my officemates would want a copy of this as well as kubori kikiam. Komiks atbp.5 by Point Zero was already sold out when I arrived. Too bad, I didn't get to see my own comics inside that issue (Wonder Callboy). 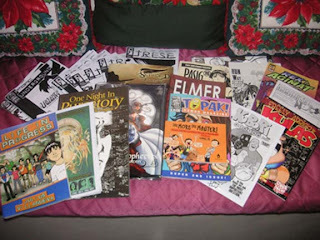 Congrats to all of you who were able to release an issue this komikon. I didn't realize that there were a lot of cute comic book artists - naks! (uuuy may tuwang tuwa diyan na isa). Ended my day with a dinner in Serendra with relatives. nyarr... e kelan naman po kayo pupunta sa call center namin para makita ka na namin in person? thanks for coming! nice seeing you!